Do You Let Your Kids Climb Up The Slide? Are you one of those parents who let their kids climb up the slide? I can't even tell you how many times in a day I tell my son to get the wheels off the slide, but his body? Eh… Somehow, that seems like the lesser of the two evils to me. 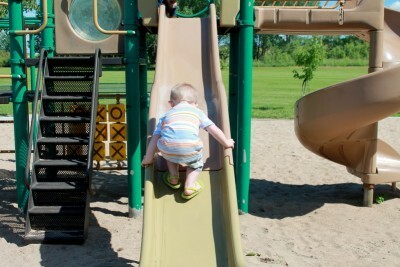 One mom wrote about the great slide debate. You definitely have to check it out, especially her reasoning for being totally okay with her kids climbing up the slide. It'll seriously make you take a step back and think. See for yourself on the next page. (VIDEO) Are You Ready For PokeMom Go? As long as no one is waiting to come down. Yes. Yep stop micromanaging kids play! Its ridiculous!! Nope! Sliding is for going down, especially when there are other children waiting to slide! Slide down, climb back up the steps or ladder and repeat! The most common answer would be yes because most the parents dont watch their kids at the park. They’re aloud to do anything! Oh I miss the 80’s sometimes! I climbed up slides sometimes too, if kids were sliding down, I didn’t…I didn’t turn out messed up and have respect issues. It amazes me how everyone gets all upset over little things. Let kids be kids…it only lasts a short time. If she wanted to and no other kids are trying to go down yep. I did it all of the time as a kid. No biggie. As long as no kids are coming down, yes I do. No no no how extremely wrong you are!! My kids climb up the slide & im right there watching you ignorant woman! Its a park…they’re kids having fun, exploring, experiencing…. Obviously if another kids wants to go down my kids are off it, but don’t label people when you clearly have a blind fold on!! There are rules for a slide?? Oh wow, come on. It doesn’t teach them anything harmful or disobedient. Its kids having fun, obviously if another wants to slide down they move but otherwise let kids be kids, no bubble wrap! I was also unaware of there being “slide rules”. I have a huge slide in my backyard and I see no rules on it. My youngest loves to climb up. He grins from ear to ear due to his accomplishment. Of course kids should not do it if others are in line waiting to come down….let them be kids. This has to be the dumbest comment ever. I have a huge slide in my backyard and nowhere on it are posted “rules”. My two year old loves to climb up. It’s a sense of accomplishment for him…I take exception to this comment because not all parents are ignoring thier kids. If we are at a playground he does not climb up. At two he may not understand why, but he does as he’s told. I’m certainly not going to get in a “huff” if he’s at school and has to be reminded that he’s not to climb. I’ve raised three kids plus this one and none of them are scarred over a slide. I agree with Melissa, when I was doing my practices I was in a elementary school and we had a lot of trouble with kids wanting to climb up the slide because that’s how parents let them. Yes there are rules. One, they can fall and bust a lip or worse, toddlers and some kids don’t move while someone is coming down or vice versa. I personally saw how other teacher yelled at them and I prefer to teach my daughter to use things appropriately then someone else telling her she did it wrong all her life. Couldn’t have said it better. I’m a teacher and we deal with these things all the time navies parents don’t teach kids the right way and we have to discipline the kids. I agree with Sina Rhodes, I used to teach in a elementary school and going up a slide is forbidden, if a teacher saw them they would loose their recess that day and I would get multiple responses like “my mommy lets me” or “I do it all the time at home” well sweetie your parents obviously don’t know better and now, here are he consequences. I felt bad for them? Yes I did, because I have a daughter sometimes we let our kids do things because they are little or they are learning and exploring but we are not teaching them the right way into society. We all have different parenting ways, but in the end there are rules. Yes I remember doing that once or twice when I was young but hell my mom would tell me that that’s not what the slide is for. Seeing it from an educator point of view, everything has rules, especially a playground. Up the stairs, down the slide. Why is this even an article? I honestly do not let my child climb up the slide. I use to work as a daycare teacher and I saw too many kids slip and fall and bust their mouth open. One little girl lost a part of her tongue and we had to call her parents.. It’s wasn’t a pretty sight. Kids don’t listen and they will do it anyway, but I try my best to stop it. It’s always good to be safe then sorry. If there is no one else using the slide I let my kids climb up the slide but as soon as any other kid wants to use the slide I tell them that enough hunny it the other kids turn now. No. I tell mine to.go up the stairs, then down the slide. That’s the right way to.go. Elena García thank you! I’m so glad a teacher responded. I guess some parents don’t care that there are rules that someone else will make their child follow and they are for in place for a reason. I guess some don’t care their child will have to sit out when they don’t follow the rules at school. I feel there is a difference between “parenting differences” and following safety rules. Now it would be interesting to have a nurse or ER Dr respond to the amount of cases they see a year that deal with misuse of playground equipment! Accidents happen often enough when we are trying to teach our children to play on the playground following the rules. Who else here thinks the slide$#%&! @*must be an only child parent? My son loves climbing the slide but if there are other kids waiting to go down the slide, its off the slide and quick trip around to ladder. If there is no one else waiting, then sure, have fun! Common courtesty. My daughter use to love climbing up the slide, but that stopped after she busted her chin open doing it. By the time I finish yelling that he is not supposed to climb the slides, my son is up them. Even the curled ones. If he sees somebody coming, he slides down to avoid getting smacked in the face. Wish everything else was so simple. At home anything goes but when we are at public places we follow the rule of up the stairs, down the slide.